Kara Miller is the host and executive editor of Innovation Hub from WGBH and PRI, which she started in 2011. Innovation Hub launched nationally in 2014. The show focuses on the creative thinking in areas from healthcare to transportation, technology to education. It has featured Sal Khan, Marissa Mayer, Tom Friedman, Jared Diamond, Michael Pollan, Sherry Turkle, and Steve Wozniak, among others. Kara also contributes to The Takeaway, a national radio program hosted by John Hockenberry, and WGBH's Morning Edition. Kara's writing has appeared in The Boston Globe, The National Journal, The Boston Herald, TheAtlantic.com, The Huffington Post, and the International Herald Tribune. She holds a PhD from Tufts and a BA from Yale. She has taught at the University of Massachusetts and Babson College. 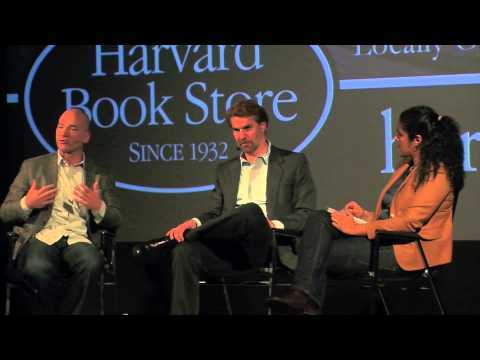 Andrew McAfee received his Doctorate from Harvard Business School, and completed two Master of Science and two Bachelor of Science degrees at MIT. He is currently a principal research scientist at the Center for Digital Business in the MIT Sloan School of Management, and a fellow at the Harvard's Berkman Center for Internet and Society. McAfee coined the phrase "Enterprise 2.0" in a spring 2006 Sloan Management Review article to describe the use of Web 2.0 tools and approaches by businesses. His book, Enterprise 2.0: New Collaborative Tools for Your Organization's Toughest Challenges, studies the ways that information technology (IT) affects businesses and business as a whole. McAfee is the author or co-author of more than fifteen scholarly articles and ninety case studies for students and teachers of technology. He speaks frequently to both academic and industry audiences, and has taught in executive education programs around the world. In 2008 McAfee was named by the editors of the technical publishing house Ziff-Davis number 38 in their list of the "100 Most Influential People in IT." Dr. Rodney Brooks is a robotics entrepreneur and founder, chairman and CTO of Heartland Robotics, Inc. He is also a founder, board member and former CTO (1991 - 2008) of iRobot Corp and the Panasonic Professor of Robotics (on leave) at MIT. Dr. Brooks is the former director (1997 - 2007) of the MIT Artificial Intelliigence Laboratory and then the MIT Computer Science & Artificial Intelligence Laboratory (CSAIL). He received degrees in pure mathematics from the Flinders University of South Australia and a PhD in Computer Science from Stanford University in 1981. He held research positions at Carnegie Mellon University and MIT, and a faculty position at Stanford before joining the faculty of MIT in 1984. He has pubished many papers in computer vision, artificial intelligence, robotics, and artificial life. Dr. Brooks is a member of the National Academy of Engineering (NAE), a founding fellow of the Association for the Advancement of Artificial Intelligence (AAAI), a fellow of the American Academy of Arts & Sciences (AAAS), a fellow of the American Association for the Advancement of Science (the other AAAS), a fellow of the Association for Computing Machinery (ACM), a corresponding member of the Australian Academy of Science (AAS) and a foreign fellow of the Australian Academy of Technological Sciences and Engineering (ATSE). He won the Computers and Thought Award at the 1991 IJCAI (International Joint Conference on Artificial Intelligence). He has been the Cray lecturer at the University of Minnesota, the Mellon lecturer at Dartmouth College, and the Forsythe lecturer at Stanford University. He was co-founding editor of the International Journal of Computer Vision and is a member of the editorial boards of various journals including Adaptive Behavior, Artificial Life, Applied Artificial Intelligence, Autonomous Robots and New Generation Computing. He starred as himself in the 1997 Errol Morris movie Fast, Cheap and Out of Control named for one of his scientific papers, a Sony Classics picture.